"It suggests strength of character, boldness and an unwillingness to conform." While we craft your suit you should consider just how you can make a strong statement from its first wear. Blue is a colour conveying many things about its wearer. It suggests strength of character, boldness and an unwillingness to conform. A blue suit tells a story of a man who knows what he wants and isn’t afraid to stand out. Essentially, you. Blue suits pair well with most shirts, but look their most splendid with white. A crisp white shirt underneath a blue jacket has a certain luminance, paired together they form a solid foundation for accessories to play their part. By making a statement with the simplicity of a blue suit and white shirt, they really have an opportunity to shine. Tie choice should be your first consideration. Strong colours communicate your purpose, other variations show a softer side. Reds, with perhaps the exception of vermillion, mean a fortified approach to dressing. Ties include burgundy and maroon—these rich reds give depth and will pick up any red hues in the cloth of the suit. Golds look equally impressive, particularly champagne, without looking garish. Blue and green can be seen, just keep the shade sage or similar for the best result. 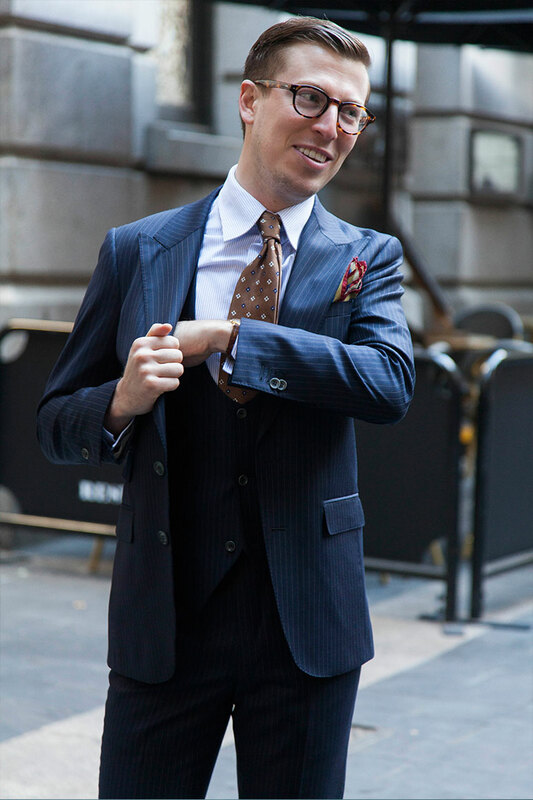 Pocket squares are always slick, but don’t overdo it when you have a tie vying for attention. A simple white silk or cotton square is sufficient to pull your look together. Cufflinks in muted silver or gold tones are sophisticated touches without looking flashy, or a simple tie bar will anchor the look. Keep them polished, but play down shine for a more refined approach. In terms of shoe choice, brown or black work just as well. You even have the option to introduce other derivatives such as tan or chestnut—just make sure you get the shade right. Like other accessories maintain your shoes so not to detract from your new suit. It will be with you before you know it.